Lurainya Koerber will be teaching 4 nights of “The Basics and Benefits of Bellydance.” Perfect for beginners and a nice refresher for those students who already have experience. Wear comfortable clothing that allows for movement (you do not need to bare your belly!). It’s preferable that you bring a scarf to tie around your hips, but it is not necessary. Lurainya Koerber is an artist, advocate, writer, and dancer. She is the Founder/Director of Lurainya’s Realm, LLC and MoonGypsy Productions, as well as a 501c3 nonprofit called WomenMove Inc. Lurainya was a featured performer of Casablanca restaurants for 10 years and has been highlighted in numerous articles and TV segments about exercise and entertainment. 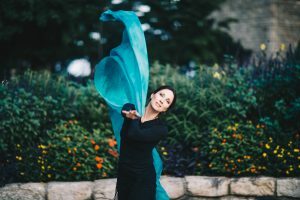 She spent 15 years teaching and performing full-time what is known as Bellydance Fusion, melding aspects of Indian, Tahitian, and Flamenco styles with traditional Middle Eastern and North African dance.She is returning to the world of dance after being away for many years due to debilitating health issues caused by side effects of Lyme Disease. With enthusiasm and joy in her heart to reconnect with students and resume her passion for dance, she looks forward to returning to DragonFly Yoga Studio in March 2019.